What is the address and phone number at the Gaylord Rockies Hotel and Convention Center? What is the summit attire? Proper attire is business casual. Who should I contact if I am interested in presenting at the Summit? Please email CStclair@eventPower.com with your biography, area of expertise in energy, and description of what you would present. You can update your registration information using the link in the confirmation email that was sent after you registered. If you cannot find the email, email ARPAE-Registration@eventPower.com for assistance. Who do I contact to receive an invitation letter for a Visa? Email ARPAE-Registration@eventPower.com to request an invitation letter for a Visa. You will be charged the cost to mail the letter. Does the Summit offer group discounts? If you are registering 5 or more people to attend the Summit (same company), please email ARPAE-Registration@eventPower.com with the number of people you are planning to register and they can assist. Are there any rooms I can use for a quick meeting at the Summit? Yes. There are open meeting rooms in the meeting space that are available on a first-come, first-served basis. Is wi-fi available in the meeting space? I am not an ARPA-E Awardee, but would like to exhibit in the Technology Showcase, how can I? Companies (large and small, established and startup) and other organizations (academic, research labs, non-profits) with a specific transformational energy technology to display are invited to apply for Technology Showcase exhibit space. Please note that we are NOT looking for incremental improvements on current technologies, but disruptive and transformational energy innovations. Service providers and consultants are not good candidates for the Technology Showcase, but can exhibit in the Partner Showcase. How do I exhibit in the Partner Showcase? The Summit attracts the “who’s who” in energy technology innovation—from top researchers and technologists to investors, influential policymakers, and other key industry decision makers. Summit partners can generate significant brand exposure through exhibit and sponsorship opportunities. Please visit the Partner Information tab for more details. The ARPA-E Energy Innovation Summit is an annual conference that brings together thought leaders from business, government, and academia to discuss cutting-edge energy issues and cultivate relationships to help move technologies towards the marketplace. Summit topics range from high-level industry overviews to focused discussions on developing and deploying next-generation energy technologies. In addition, the Technology Showcase is a major attraction of the Summit that includes hundreds of carefully selected transformational technologies—many of which are displayed publicly for the first time during the Summit. How many years has ARPA-E held the Summit? 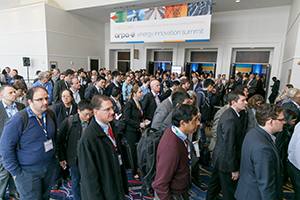 ARPA-E will host its tenth Energy Innovation Summit in July 2019. How many people attend the Summit? In 2018, the Summit hosted nearly 1,800 registered for the Summit, from 46 states and 12 countries. How many technologies are featured in the Showcase? The 2018 Technology Showcase featured nearly 300 transformational energy technologies and innovations. Technology Showcase participants are ARPA-E awardees, entrepreneurs, researchers, and experts ready to collaborate with investors and decision-makers to move their ideas into the marketplace. How many projects has ARPA-E funded? As of February 2018, ARPA–E has invested in more than 660 projects. The America COMPETES Act of 2007 authorized ARPA-E within the U.S. Department of Energy. However, ARPA-E was not established until early 2009, when it received $400 million in funding through the American Recovery and Reinvestment Act. Where can I find information about ARPA-E funding opportunities? Please visit https://arpa-e.energy.gov/ for information about current Funding Opportunity Announcements (FOA).